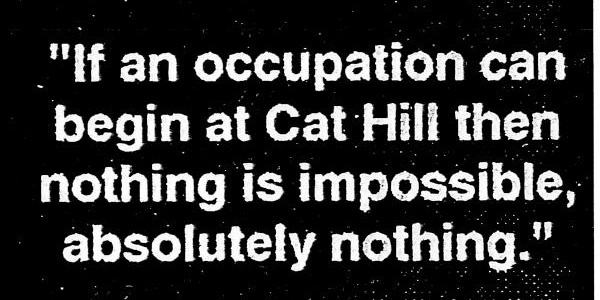 I remember there were so many great events put on at the occupation including a debate possibly on the Situationists?, between the SWP and someone from Here and Now - does that still exist? Another debate was between the WRP (?) and the 'Anarchist Workers Group' during which the young AWG came off as far more Leninist than the old party hacks. were you a student there at the time? Yes! Had only been in the country a few months so it was a great introduction to things. Set me up for the next 15 years in London. I'm sure there are others from those days who lurk here on Libcom. You know, there was later a lot of anti-student rhetoric in the my corner of the anarcho/libertarian scene but when we were there at the Enfield site in working-class Ponders End (not too far from Visteon I think) we got tons of support locally, people dropping by with food and wood, happy to give us money when we collected in the town centre, etc. Gosh, they were great times. We really felt like we had achieved something; from the small wins of getting a decently priced single parent and child meal in the canteen to national coverage of our occupation. I was on the SU committee at the time....still have all the old 'Occupation daily' newsletters we produced and a fair few photos. if you have a scanner, or smart phone you can put a scanner app on it would be great to host the newsletters here, or failing that some of the photos at least! Alternatively, if you have spare copies of some of the newsletters maybe you could donate them to us to digitise and put online? Let me know what you think!